Grease and flour a 9 by 2-inch round cake pan. In the bowl of an electric mixer fitted with the paddle attachment, mix the bananas, granulated sugar, and brown sugar on low speed until combined. With the mixer still on low, mix in the oil, eggs, sour cream, vanilla, and orange zest. In a separate mixing bowl, sift together the flour, baking soda, and salt. With the mixer on low, add the dry ingredients and mix until just combined. Pour the batter into the cake pan and bake for 45 minutes or until a toothpick inserted in the center comes out clean. Remove from oven when finished cooking and cool in the pan for 15 minutes. Then, turn the cake out onto a wire rack to cool through. 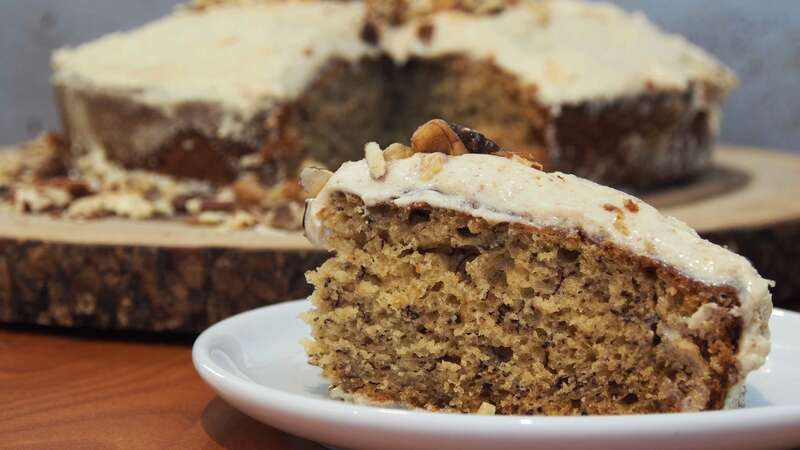 To decorate, spread the frosting thickly on the top of the cake and decorate with chopped walnuts and walnut halves. In the bowl of an electric mixer, using the paddle attachment, combine the cream cheese, butter, and vanilla on low speed. Mix in the sugar and salt and beat until smooth. Add the the almond butter and mix until combined.